Small Businesses Doing Big Things; Active Telephone and Data’s new mobile responsive website. Working with Small and Mid Size Businesses ( #SMB ) has been a constant throughout my career, and it never ceases to amaze me how vital these companies can be to a community, to large businesses, and to their staff. Active Telephone and Data (AT&D) was no different. Having met Marty Shekelton, owner/operator of Active Telephone and Data (AT&D) months before working with him, I invited him to join a networking group hosted at the Arlington Heights Memorial Library. It was a few months before I earned Marty’s trust enough to discuss working together. Marty and his team (Bob and Robin) manage telecommunications for businesses of all size. 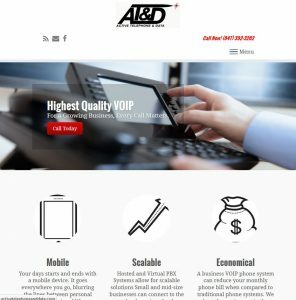 From startups to enterprise organizations, AT&D manages legacy telephones including Nortel as well as cutting edge Voice Over Internet Protocol (VOIP) systems leveraging the internet to connect calls. A dated website and social presence greeted customers visiting: www.activetelephoneanddata.com prior to our engagement and it didn’t really present VOIP telephony, a growing portion of AT&D’s business. Taking into account the marketing strategy Marty hoped to implement, we rolled out Phase 1, a new mobile friendly, responsive website. The challenge became communicating all of the legacy telephony solutions while incorporating the scalable nature of the VOIP solutions. Marty and his team can truly offer phone lines for any situation from 1 line to 100’s of lines. We also worked to create a customer portal where clients can contact network support, make payments, and/or open tickets for resolution with Marty’s Tech Team. Advanced call management, reliable phone and fax service, tele-conference capabilities and mobile access are just a few of the options available with phone systems through Active Telephone & Data. What I’ve learned about Marty, is that his passion and knowledge in his industry is matched by his desire to ‘do right’ by his clients. Often the first to arrive on the job site, Marty doesn’t leave until the client is happy. Whether it’s a home office setup or a hotel with numerous connections. Unearthing businesses like Active Telephone & Data is what we love about what we do. We help businesses of all size, #BeSeen & #BeHeard across Web, Social, and Search channels. Whether it’s phone systems used daily by every office in Arlington Heights, or leisure activities like Tennis. JRS Mar/Com is always waiting to discuss your business’ digital marketing strategy.